Recent research published in BMC Psychiatry shows low levels of B12 vitamins are associated with depressive symptoms such as low mood, poor sleep and loss of appetite. Adequate B12 levels are fairly easy to obtain in your daily diet. For example, consuming 8 oz of yogurt and a slice of swiss cheese would get you your daily dose of B12. (The vitamin is often not adequately absorbed and a blood test with an assessment by your doctor may indicate you require this essential vitamin to be injected). 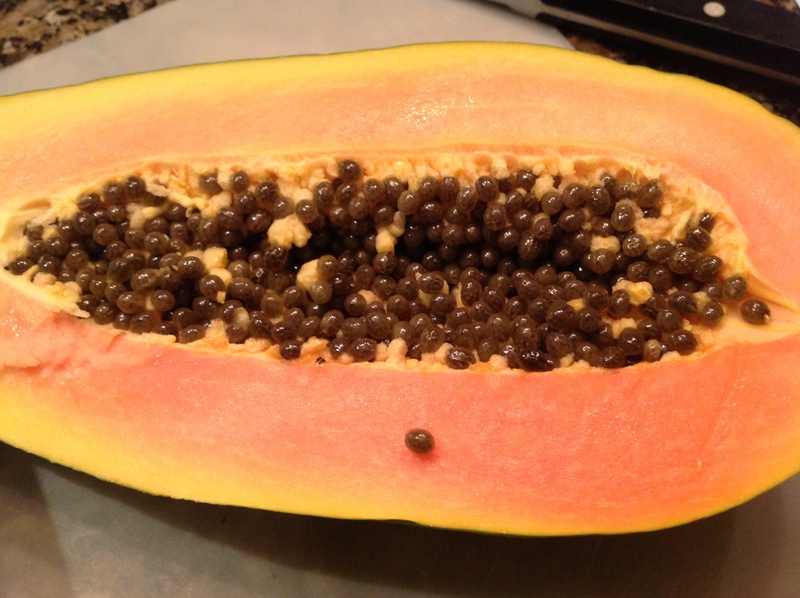 Since this has been a brutal winter in many parts of the country, I set out to create a recipe that was loaded with B12, tropical in flavor, tasty and would boost our mood both nutitionally and visually. Socializing with friends has been proven to be one of the best mood elevators and insurance against aging, and this recipe is perfect for a luncheon for 4. Another finding from my research on seasonal affective disorders has discovered that chamomile tea was shown to lift mood 20 to 30% in depressed subjects( Self magazine, February 2014). Its flavanoids may increase levels of dopamine and seratonin, the feel-good hormones. A reader survey in a national magazine has recently shown that 19% of readers beat the winter blues by bringing home flowers. Armed with all this research, I set out to create a lunch menu with friends featuring a shrimp-papaya salad with a skinny green goddess dressing and chamomile iced tea served on a pretty table set with flowers, of course. Since chamomile tea can be bitter and associated with bedtime, I found an invigorating blend called Bravissimo((David’s Tea) with orange peel, licorice and rosehip accents. It could be served with a simple syrup or honey for sweetener. If by now you are convinced it might never be warm again, this salad is the opposite of winter comfort food: brightly hued, invigorating, fresh. It’ll transport your soul to a sunny place! 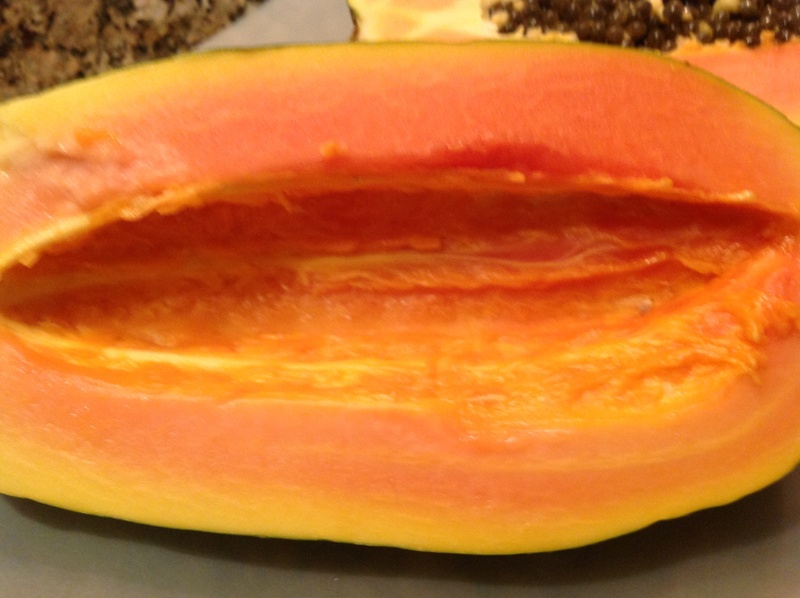 Cut papayas in half, scoop out seeds, and carefully remove flesh without perforating skin as the empty papaya shell will be used as a boat. 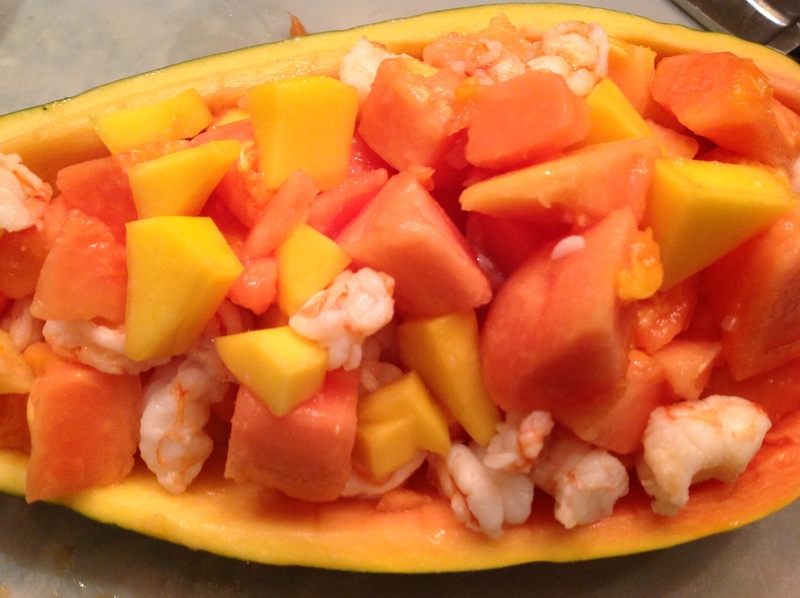 In a large bowl, cube the papaya fruit, mix in the mango and shrimp. Squeeze the juice of 2 limes over all and gently toss to coat. 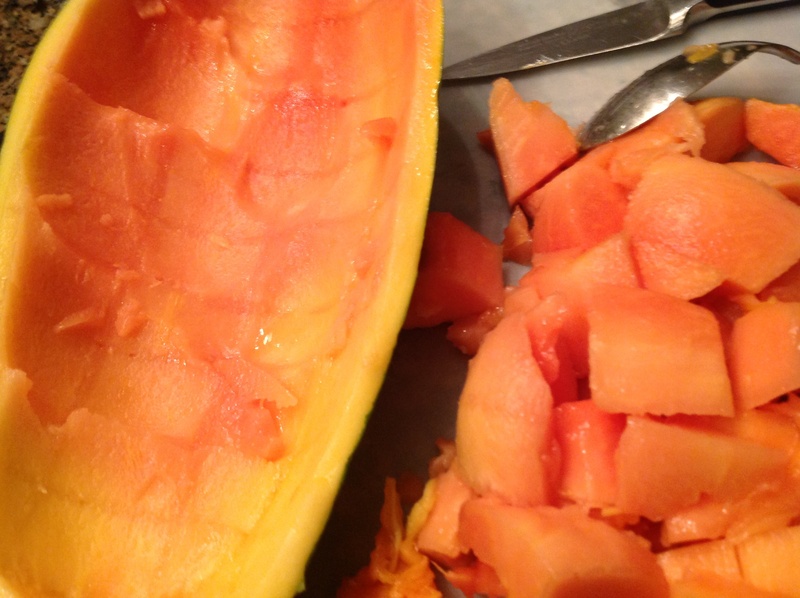 Divide the mixture in 4 and fill the reserved papaya halves with the salad. 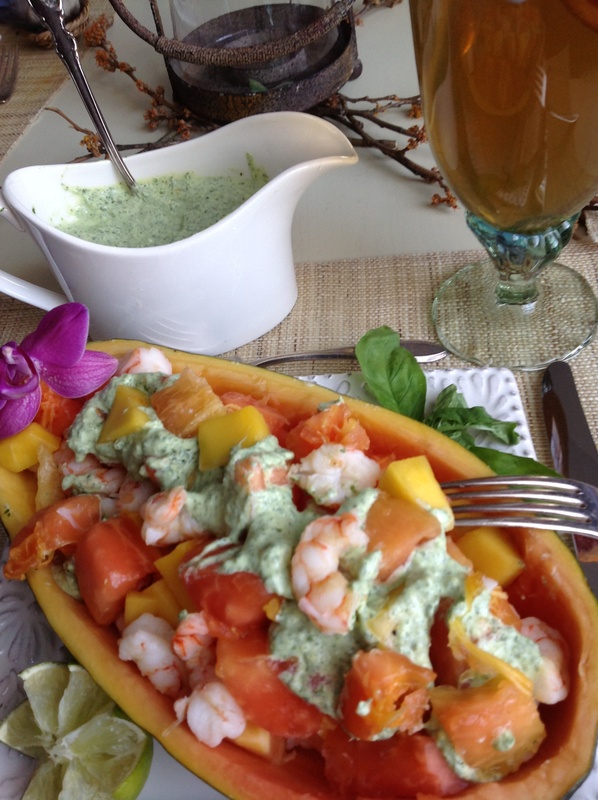 Serve with Green Goddess dressing on the side and additional wedges of lime. 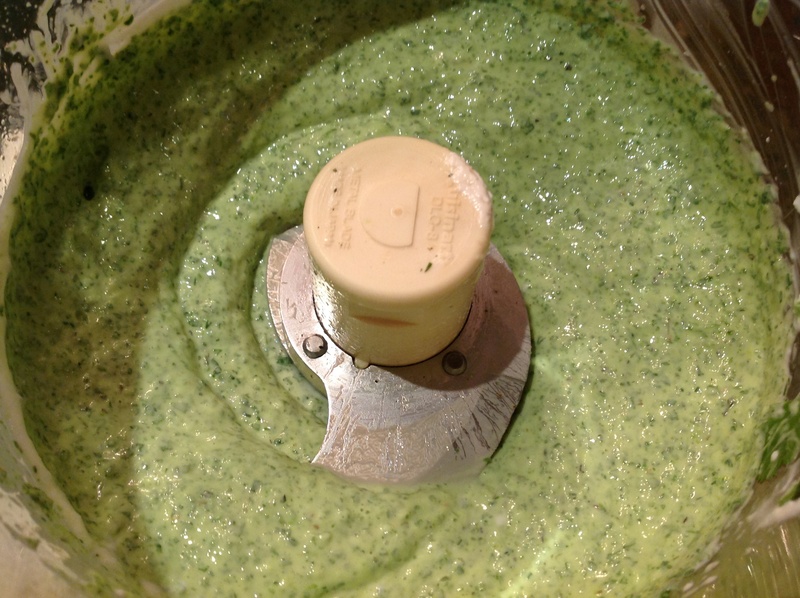 Green Goddess dressing is traditionally made with sour cream and buttermilk. This version is made with non-fat yogurt for maximum dose of vitamin B 12. You can substitute your favorite herbs. In a food processor fitted with a blade attachment, process all ingredients until smooth. 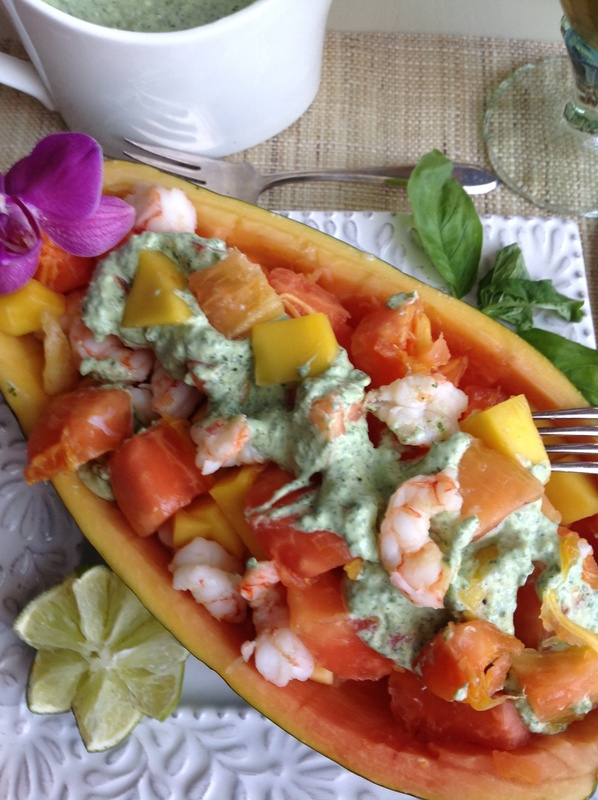 Serve this delicious dressing on the side in a gravy boat with your shrimp-papaya salad. Setting this table I thought of emphasizing the theme with a blue and white scheme. 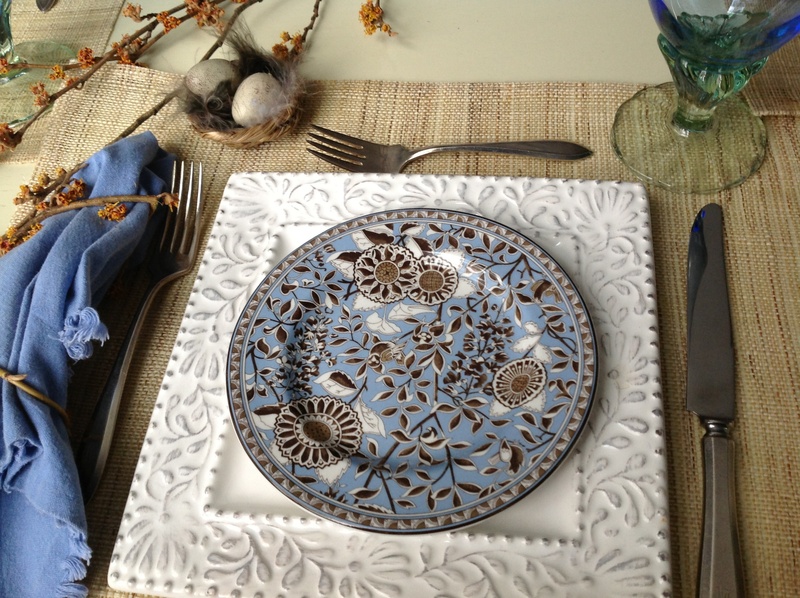 I chose square luncheon plates in white(TJMaxx) topped with a floral blue, brown and white white plate for a soft organic feel. 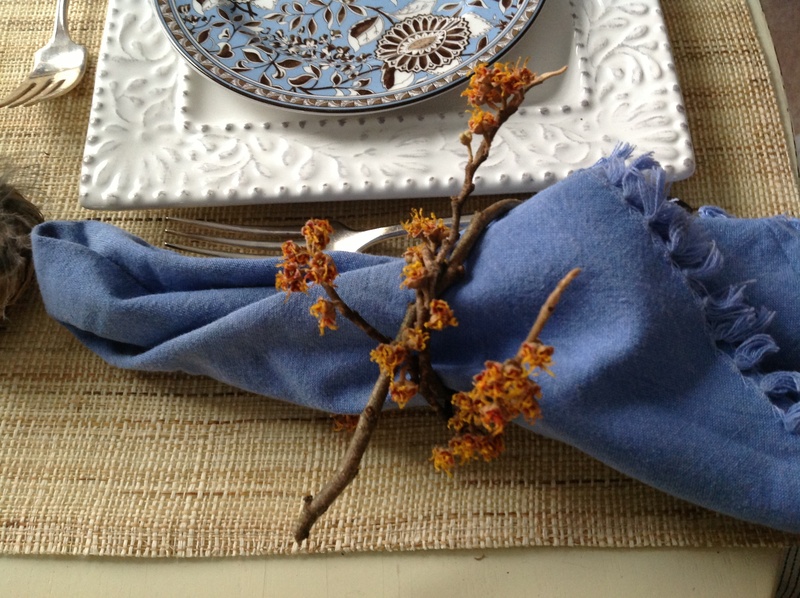 The blue napkins were tied with branches of witch hazel from the garden while the woven place mats bring another organic layer to the setting. 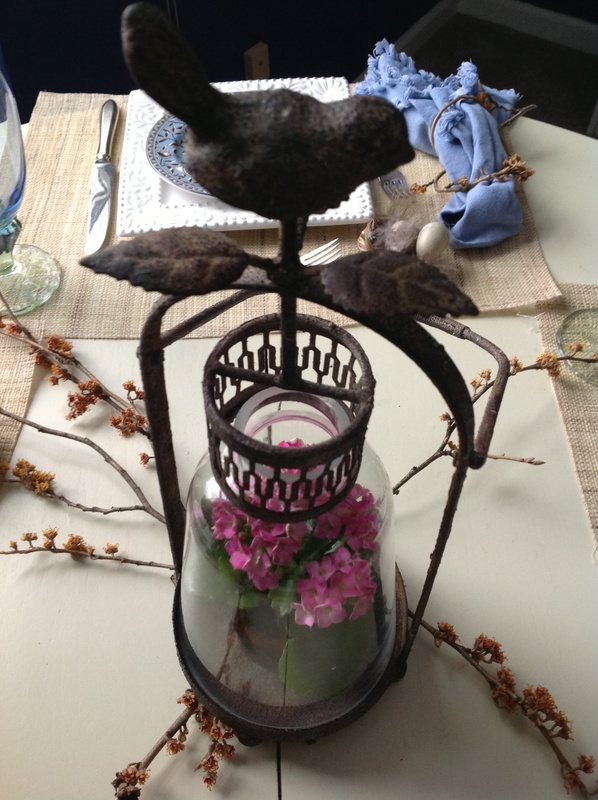 A bird-topped cloche(Marshall’s) holds a delicate pink flowering plant and radiating from this I added additional flowering witch hazel branches. To encourage my guests to think spring, I placed mini bird’s nests with their eggs(JoAnn’s) at each place. Tall blue glasses(Marshall’s) adorned with a cheerful garnish of blood orange were set for the iced tea. This simple, serene tablesetting was a harbinger of spring and let the bold beauty of the shrimp-papaya salad really shine. I hope this sunny menu and idea for a casual lunch has gotten your creative juices flowing and inspired you to host a B-Happy lunch to chase away your friends’ winter blues. “Don’t worry, be happy!” Bobby McFerrin, humming along, optional! 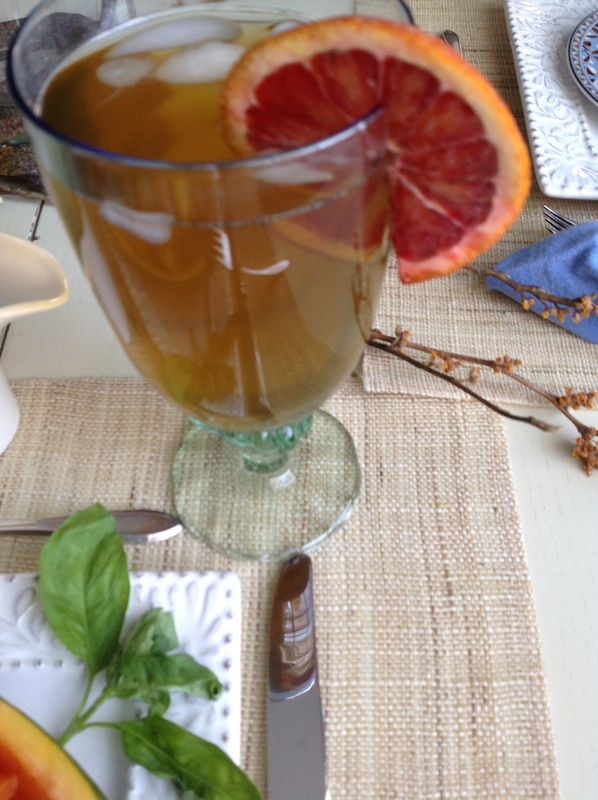 This entry was posted in Entertaining, Recipes, Tablescapes and tagged bird-themed tablescape, chamomile tea, mango, Papaya, salad, seasonal affective disorders, shrimp, vitaminB12, winter blues by Johanne Lamarche. Bookmark the permalink. This was inspired by our trip to Punta Cana! The tea was one of the gifts you and Millie brought me from home. Had a blast with Dana! I have had B-12 injections throughout my life, and no doctors ever address how to boost it through diet. Thank you, Dr. Lamarche! What a great post. I can’t wait to try the recipes! Thank you Lynne! I shall make this salad for you soon ! What an amazing talent you have Johanne! Love all your posts!